Setting up a ping-pong table requires planning and physical assembly. Ping-pong, or table tennis, is a recreational sport which is fast-paced and enjoyable, and can also provide good exercise. However, before you can play, the ping-pong table requires assembly, since most of them are sold unassembled. Preferably, this should be done in the space where you plan to play so you won't have to move it. After you have purchased the ping-pong table, gather tools and find a space where you can set it up properly. Pick a location where you want the ping-pong table to be, and begin assembly there. 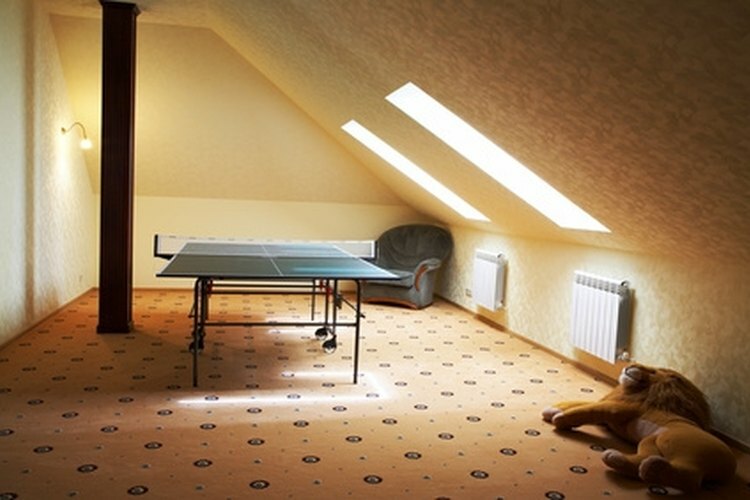 It should ideally be a big room which doesn't have a lot of nooks and crannies, and places for errant ping-pong balls to get lost easily. You will also want sufficient space around the table to run, duck and swing at balls. A garage, a game room or a loft with a lot of extra, empty space are ideal locations to set up your ping-pong table..Bring your table to this location so you can assemble it right there and won't have to move it. Build the middle brace out of the parts which came with your ping-pong table by attaching the four upright tubes together with a cross brace. This will serve as the middle support for the two sides of the ping-pong table. Connect these with screw and bolt hardware which came with the ping-pong table itself, using screwdrivers and a wrench to tighten everything down. Attach wheels to the bottoms of the upright tubes by banging them in lightly with a hammer, so the ping-pong table will be able to be folded up and rolled out of the way once it is constructed. Attach U-supports to the bottom of each section of the ping-pong table with braces and screws. Attach the shorter U-support brace to the middle of the section of the ping-pong table and the longer U-support to the front edge of the ping-pong table section. Attach a linkage bar between the shorter U-support and the longer U-support using a metal safety strap and bolts which run through the leg of the longer U-support. This way the ping-pong table will be able to fold up to be stowed away once it is assembled. Lift one section of the ping-pong table with the attached U-supports folded against the bottom of the table up onto the center support tubes. Make sure you are attaching the shorter U-support bars into the tops of the U-support tubes and affixing them firmly in place. Fold one half of the table down, so that the longer U-supports act as legs on one side. Repeat these steps on the other side. Once you have folded both sides down, the basic table will be assembled. Attach the braces to the space in between the two sections of table, tightening each brace from the bottom, so that each section is pulled close together. Attach the net to the top of one brace and run it the width of the table so that the other end of the net is attached to the other side. Roll the net once or twice before attaching it to pull it taut, if necessary. Make sure the ground is level so that you have a fair, flat playing surface when the ping-pong table is fully assembled. Keep all water away from the ping-pong table, even if it is an outdoor table, as this can warp or rust the surface, making it play unevenly. Have at least one other person help you with this assembly as each section of the ping-pong table is quite heavy. You can hurt yourself lifting it or lose your balance and drop the piece, damaging the ping-pong table.